Executives from Japanese food group Nissin Foods Holdings were in the UK at the weekend to launch a global marketing campaign with Manchester United the company's management hopes will boost its international profile to help offset a stagnant domestic market. Nissin chief strategy officer Noritaka Ando unveiled a 30-second animation featuring Wayne Rooney, Robin van Persie and Angel di Maria, United's GBP59m record signing. The ad was shown to reporters an hour after United's 1-0 win against Crystal Palace with the team's players - fresh out of the showers and suited - on hand to mark one of the club's latest "global partnerships". In recent years, United have struck similar deals with the likes of Toshiba, DHL and Russian airline Aeroflot, as well as Malaysian snack brand Mister Potato and Chilean wine group Concha y Toro. 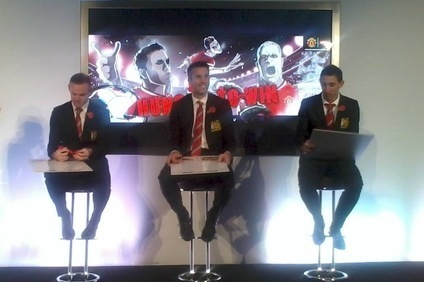 During the presentation, Rooney, van Persie and di Maria were asked to take to the stage to draw cartoons of one of their team-mates. The win against Palace had been particularly hard-fought, with some spectators left wondering about United's creativity but there was some artistic flair on display on the stage, with van Persie's take on goalkeeper David de Gea the best of the efforts. Once the players had posed with Nissin's Cup Noodles and had left, just-food asked Ando why Nissin had decided to invest in the sponsorship. Ando said United have "lots" of supporters in some of Nissin's main markets, including China and south-east Asia. Nissin has also got its eye on expanding its presence in Africa, he said. "They have fans all over the world, so we would like to use their fanbase to increase our marketing base, as well as our own country Japan, we want to do more in south-east Asia and in Africa as well," he said. Nissin works with Japanese tennis player Kei Nishikori - in the world's top five, according to the latest rankings - but the tie-up with United is the company's first with a club and outside Japan. Jamie Reigle, MD of Manchester United's operations in Asia Pacific, said one of the benefits of working with Nissin was the "experience they had in sports marketing". The win earlier in the afternoon against Palace took United - for 24 hours - up to 6th in the Barclays Premier League. It is the club's first season since 1989/90 without playing in Europe. Reigle played down the impact United's lack of European football may have on its ability to secure lucrative sponsorships. "Manchester United has been around for 130 years and has an incredible history. What our commercial partners are buying into is that history, global fanbase, the passion of that fanbase. There's no doubt that last season was a disappointing season and we're not in Europe this year but that has a very minimal impact in terms of the interest we get from partners. Nissin has just committed very recently in that context and we have a number of other commercial partners we have signed despite those results," he told just-food. And Ando was sanguine about the possibility of United having a second successive season outside the UEFA Champions League, the blure riband event of club football in Europe and one in which any sponsor would want a club to participate. "It means that we just have to wait for the fun," Ando said with a smile.